Passages to the Past is pleased to welcome R. Scot Johns, author of The Saga of Beowulf! Until quite recently, the epic tale of Beowulf has generally been regarded as a work of fiction. Composed sometime prior to 1000 A.D., the sprawling 3200-line Old English poem tells of Beowulf’s heroic exploits as he battles trolls and ogres, serpents of the deep, and meets a fiery death again a treasure-hoarding dragon. Clearly these are elements of mythic nature, grown to legendary proportion in the telling. There are elves and giants cursed by God, sprites and wights that rule the night, and the ever-present hand of Fate that weaves the thread of human life. And yet, mixed in among this fabulous assemblage of inhuman creatures and the subsequent super-human adventures, are references to other battles, wars and feuds that humans fought, in realms where actual mortals dwell. We are told in scattered passages of blood-feuds raging between the Swedes and Geats, of tragedy and treachery among the royal house of Danes, of mead-hall sieges and Viking raids. These events take place within a world that is at once remote and yet familiar, known to us if but in name, in lands we walk today. These are the stories of our own far-fathers, told by those who saw them fall. Ironically, the very first editor of the poem, Grímur Jónsson Thorkelin, asserted in his 1815 edition that the unknown author of Beowulf was, in fact, an eyewitness to the events described within, and the presenter of the eulogy at the hero’s funeral. This unfounded assertion may have inadvertently derailed serious academic study for years to come, and yet, it was only two years later, in 1817, that Frederik Grundtvig identified the Geat king Hygelac of Beowulf with its Latin equivalent Chochilaicus in the near-contemporary Historia Francorum of Gregory of Tours. In that 6th century chronicle of early France, Gregory tells of a fatal raiding expedition that resulted in the death of the Hygelac at the hands of Theodoric’s son, just as it is told in Beowulf. This is further corroborated by the mention in the poem of the “merewioingas” as an enemy of Geatland, these being the Merovingian kings of France. The name of Hygelac is given in two further extant sources, in one of which it is told how he was slain in battle on an island in the Rhine. This has since become the crucial link for dating the events of Beowulf, which places the death of Hygelac in circa 515-530 A.D. In 1881, excavations began on the famous burial mounds of Vendel and Old Uppsala in Sweden, within which were discovered ship burials of the very kind described in Beowulf. Using modern dating techniques along with chronicles of Swedish kings and Old Norse sagas, it is believed that these belonged to Ongentheow and his eldest son and grandson, Ohthere and Eadgils. Likewise, many other names from Beowulf are found in other sources, such as the Anglo-Saxon warrior Hengest, Ingeld of the Heathobards, and Hrothulf, Halga’s son, whose exploits merited a story of his own in the Old Icelandic Saga of Hrolf Kraki, in which we are provided with the missing name of Hrothulf’s mother Yrsa in the seemingly corrupt line 62 of Beowulf. Just who the Geats were is unknown, but it is generally believed that this clan of Beowulf’s bloodline equate with the Gautar of southern Sweden who gave their name to modern Gothenburg and the Göta River. Debate still rages over the many historical details strewn through Beowulf, but it is no longer argued that these events are based on fact, obscured by time as they might be. Like the stories of Homer or of Robin Hood, the lure of legend has consumed the grain of truth that once gave birth to these ancient tales of famous men: men that walked this earth and bled their lives into a poet’s pen. In The Saga of Beowulf I have made every effort to present these historic “facts” in something akin to the manner in which they might well have unfolded, while not ignoring the overwhelming layer of myth and lore that makes this oldest of English epics so enthralling and entertaining. For more on the story behind the story of The Saga of Beowulf, please visit my website at www.fantasycastlebooks.com, where you will find a wealth of resources for your further enjoyment of this epic historical adventure. 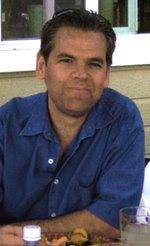 R. Scot Johns is a life-long student of ancient and medieval literature, with an enduring fascination for Norse mythology and epic fantasy. He first came to Beowulf through his love of J. R. R. Tolkien, a leading scholar on the subject. As an Honors Medieval Literature major he has given lectures on such topics as the historical King Arthur and the construction of Stonehenge. He owns and operates Fantasy Castle Books, his own publishing imprint, and writes the blog Adventures of an Independent Author, where you can follow his progress as he writes The Jester’s Quest, his second novel. The story follows the young Norse warrior Beowulf as he embarks upon a fateful quest for vengeance against the creature that slew his father, setting in motion a sequence of events that will bring about the downfall of a nation, all the while fleeing from the woman he has sworn to love. Based on extensive historical research and steeped in Nordic myth and lore, the saga unfolds across the frozen fields of Sweden and the fetid fens of Denmark, ranging from the rocky heights of Geatland to the sprawling battlefields of ancient France, as our hero battles men and demons in a quest to conquer his own fears. "An epic adventure 1500 years in the making," this classic tale now comes to life once more in a bold new retelling for a modern audience. Thank you all so much for stopping by, and my sincere thanks for Amy for allowing me to guest today on her awesome blog! I do believe this will become a regular stop for me to read. I'll be checking in later today to respond to any comments left, so please feel free to ask any questions or offer any insights you may have. Thanks Scot, you are more than welcome! I appreciate you taking the time to tell us about your book, which is quite good! 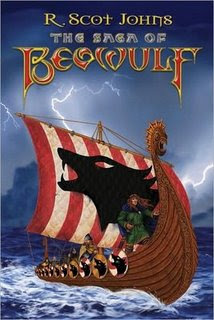 I haven't read Beowulf since high school but am intrigued by this book! Thanks for hosting Scot today, Amy! Love the look of your blog! What an interesting post. My only exposure to Beowulf was in school, and I have to admit it did nothing for me back then. It would be neat to look at it again through adult eyes to get a different perspective. Scot, did you uncover anything in your research that you found surprising, something unexpected? Very interesting! Thanks, so much. My sincere apologies for the delay in my reply, but I have just now returned from a very lengthy work day which began 200 miles away. Thank you all for your kind comments. I do, indeed, hope you will all continue your reading of epic poetry, so much of which provides the fount of our literary origins. Judy, thank you for the compliment. That was just one of those lines that spilled out on the page, much like our poor warrior's blood. Thanks for the question. In truth, I could probably write a whole blog post on surprising things I discovered in my research, but probably the most unexpected was just how heated the academic debates surrounding Beowulf still are, ranging from whether the poet was a Christian or if the scribe who wrote it down simply inserted his own views, to whether the poem as a whole is a moral alegory or a tapestry of older folk tales. My personal favorite discovery is that the Old English word for "wise" is hyge, and thus the name of our king Hygelac means literally, "lacking wisdom." I have consequently presented his character as such in my novel. Thanks again to Amy. Beautiful job on putting the post together!